I smooshed a background for my WMS sentiment. I've used several tutorials for a smooshed background but the one I used for this card by Kristina Werner is probably my favourite. It appeals to my anally retentive tendencies, as her technique using acetate gave me more control of the ink. That's the problem with smooshing - you're never quite sure what you're going to get and quite often I get a muddy mess! 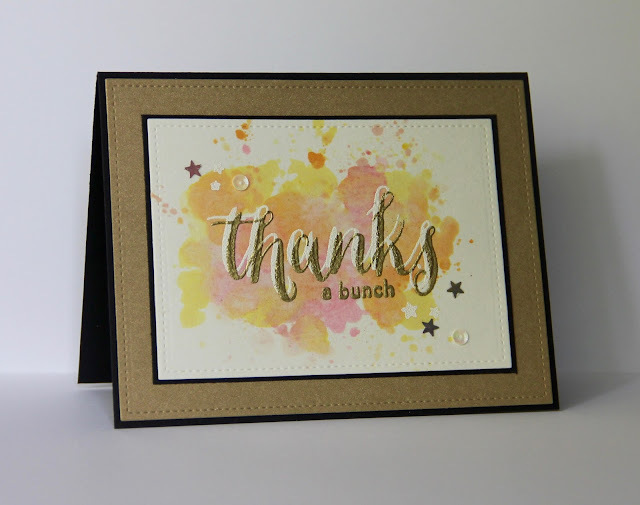 I embossed the sentiment in white first but it didn't really pop against the ink so I created a shadow effect by stamping almost over the top and embossing in gold. A scatter of sequins and it was all done! Hope you get the chance to join in the fun!